You can use either the webmail interface or an email client. If you need help configuring email clients, you can visit the step-by-step guides for configuring MS outlook and Mozilla Thunderbird. You can easily access your Webmail interface by just visiting: http://www.yourdomainname.com/webmail, where ‘yourdomainname.com‘ is your actual domain name. If this is not working for you, it might be possible that your ISP is blocking the access to non-standard ports loaded through an SSL connection. In this case, you can use: http://webmail.servername.com, where ‘servername.com‘ should be the hostname of your hosting server. 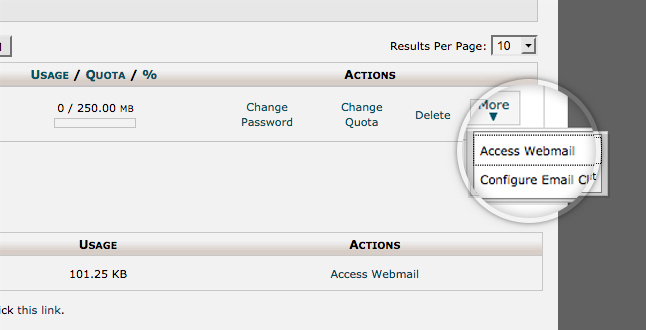 If you login to your webmail through the Webmail icon on your cPanel main page, you will be logged in with the default system email account. Do not use the default email account, because very often emails send from the system email accounts are going to the Junk folders. To login via Webmail to one of your e-mail accounts from your cPanel, you should go to Email Accounts, click the More button and then the Access Webmail link next to the account you wish to access. 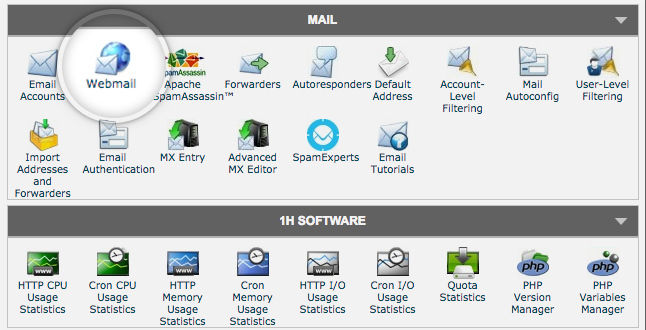 This will present you with a choice between the three default Webmail clients we offer to our clients. Click on the name of the desired one to access it.